Oxygenic photosynthesis can be carried out by many eukaryotes, but only by the cyanobacteria among the prokaryotes. Consequently, anoxygenic photosynthesis is dominantly prokaryotic and oxygenic photosynthesis dominated by eukaryotes. The oxygenic cycle has two circuits. First, a photo-chemo circuit consisting of photoaquatrophs to reduce C coupled with chemoorganotrophs, which may be either aerobic or anaerobic, to reoxidize it. Second, a chemo-chemo circuit consisting of aerobic chemolithotrophs to oxidize minerals coupled with anaerobic (or facultative) chemoorganotrophs to oxidize C and re-reduce minerals (Fig. 9.7). Electrons flow among the cycles, thereby connecting them. For example, an electron from water may be passed to CH2O during photosynthesis, proceed through the photo-chemo circuit, and be returned to water through aerobic oxidation. From there it may again be passed to CO2 (photosynthesis) to form CH2O, proceed to the chemo-chemo circuit, and under anaerobic conditions be used to reduce SO24- to H2S. In the presence of O2, it proceeds through the aerobic part of the chemo-chemo circuit and the electron is again used to reduce CO2 to CH2O concurrently with oxidation of (loss of electrons from) S2- As it continues its journey, under anaerobic conditions the electron may again be transferred to H2O, which brings it to the intersection again with the photo-chemo circuit. Hence, the oxidation and reduction of many elements, although not conducted by photosynthetic organisms, is tied to photosynthesis by transfers of electrons among organisms through the reduced C and O2 produced by photosynthesis. Hence, the oxidation of elements is made possible by O2 from photosynthesis and their reduction by the reduced C from photosynthesis. This alternating oxidation-reduction system involving chemolithotrophs requires that O2 and CH2O from photosynthesis travel separately and that there be habitats from which the O2 is excluded. Soils are uniquely suited to providing such habitats. FIGURE 9.8 The oxygenic cycles in the pedosphere entail cyclic oxidations and reductions of C, N, and S (among other elements), which are driven by solar radiation and controlled by the availability of O2. Lowering O2 availability is reflected in lowering Eh values. Oxygenic photoaquatrophs (P-A) produce CH2O and release O2; aerobic chemolithotrophs (C-L) oxidize N to NO3 or S to SO43 using O2 from photosynthesis and reduce CO2 to CH2O autotrophically. Aerobic chemoorganotrophs oxidize CH2O using O2 through aerobic respiration (heavy circle); and facultative anaerobic chemoorganotrophs oxidize CH2O using NO3 (nitrate respiration). Anaerobic chemoorganotrophs oxidize CH2O by reducing SO43 or, under extremely anaerobic conditions, by reducing a portion of the CH2O itself, thereby splitting it into CO2 (oxidized) and CH4 (more reduced). For the stoichiome-try represented here the moles of O2 substituted by N, S, or C are designated at the left. Dinitrogen fixation using reduced C ultimately from P-A is required to reduce N2 to NH3 prior to its oxidation to NO3. 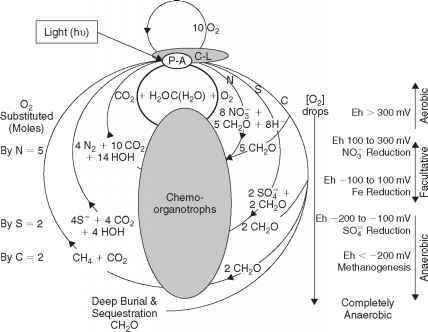 Deep burial of CH2O opens the oxygenic cycles thereby allowing O2 to accumulate. aerobic domain is set at Eh (oxidation-reduction potential) >300 mV (see Fig. 15.2), comprising aerobic chemoorganotrophs and photoaquatrophs as a syn-trophic system. The facultative domain, between Eh 100 and 300 mV, comprises chemoorganotrophs, which may be either aerobic or anaerobic in syntrophic associations with chemolithotrophs, which are aerobic. The anaerobic domain consists of strictly anaerobic chemoorganotrophs in association with photoaquatrophs. Anaerobic chemoorganotrophs in the anaerobic domain re-reduce oxidized minerals generated by aerobic chemolithotrophs in the aerobic domain. Some energy is dissipated through heat loss, etc., and must be made up by subsequent photosynthesis. Overall control is provided by O2 because it inhibits anaerobic processes. Consequently the balance among the three domains in Fig. 9.8 is a function of O2 availability in local environments or microsites. N2 fixation is interesting in that it is inhibited by O2 and mediated by three of the four groups of organisms, with only chemolithotrophs excluded. In addition, the chemoorganotrophs are responsible both for removing N from the pedosphere, by reducing NO33 to N2, and for returning it by further reducing N2 to NH3. As the Eh becomes increasingly negative oxidants become decreasingly effective (Fig. 9.8). Given that the energy available through a redox reaction is directly proportional to the change in oxidation potential between the two couples, less and less energy is released as one moves from aerobic to strictly anaerobic metabolism. Soil organisms have evolved in an energy-limited environment so communities of soil organisms use the most energetically favorable energy sources available to them. Such a strategy favors use of O2 as an electron acceptor followed by NO3, then SO43; after depletion of NO3 and SO43 a portion of the C in CH2O is eventually used during methanogenesis. In other words, CH2O is allocated first to reduction of O2, then NO3 followed by SO43, and finally methanogenesis. From a practical perspective, then NO33 might be a useful electron acceptor for metabolism of organic contaminants under anaerobic conditions. Indeed NO33 and denitrifying populations have been proposed for removal of organic contaminants under anaerobic conditions. The O2 produced during photosynthesis is consumed stoichiometrically during complete decomposition of photosynthate (compare Eqs. and ). It is not possible for O2 to accumulate in the atmosphere from photosynthesis unless large quantities of CH2O are not decomposed. We are not awash in nondecomposed plant litter, so how can residual O2 have accumulated in the atmosphere? Disrupting the cycle of photosynthesis and decomposition would retain O2 in the atmosphere rather than consuming it in oxidation of photosynthate. Disruption occurs by deep burial and sequestration of CH2O as represented in Fig. 9.8. Processes yielding soil humus, peat, shale, coal, or petroleum and deep ocean organic sediments among others over geologic time all remove CH2O from the attention of microbes that would use it to reduce O2 to water (see Logan et at, 1995). See Chap. 12 for further discussion on humus formation. Soil microbes may play an interesting role in preservation of reduced C over geologic time scales. For example, Kennedy et al. (2006) showed a strong relation between the increase of pedogenic clay and the increases in atmospheric oxygen in the later Precambrian. They postulated that soil biological activity, including that of plant roots, weathered soil minerals, resulting in formation of pedogenic clay, which in turn was instrumental in adsorbing and sequestering C. In turn, higher O2 concentrations appear to be related to development of higher animals (Kennedy et al., 2006) and development of large placental mammals (Falkowski et al., 2005). Might we imagine that "soil microbes rule the world"? Given that C storage could allow O2 accumulation, what might be the control on maximum O2 accumulation? Mineral weathering is a sink for O2 and participates in regulating atmospheric O2 concentration. In addition, oxidation-reduction reactions over geological time control Fe solubility and, because of its reactivity with P, Fe controls P concentration. Fe and P concentrations in solution, especially in marine environments, often limit photosynthesis and N2 fixation. Regulation of Fe and P solubility by the oxidation state of Fe provides a feedback to atmospheric O2 concentration (Van Cappellen and Ingall, 1996). Ehrlich, H. L. (1993). Bacterial mineralization of organic carbon under anaerobic conditions. In "Soil Biochemistry" (J.-M. Bollag and G. Stotzky, eds. ), Vol. 8, pp. 219-247. Dekker, New York. Falkowski, P. G., Katz, M. E., Milligan, A. J., Fennel, K., Cramer, B. S., Aubrey, M. P., Barner, R. A., Novacek, M. J., and Zapot, W. M. (2005). The rise of oxygen over the past 205 million years and the evolution of large placental mammals. Science 309, 2202-2204. Gottschalk, G. (1986). "Bacterial Metabolism." 2nd ed. Springer-Verlag, New York. Kennedy, M., Droser, M., Lawrence, M. M., Prevear, D., and Mrofka, D. (2006). Late Precambrian oxygenation: inception of the clay mineral factory. Science 311, 1446-1449. Logan, G. A., Hayes, J. M., Hieshima, G. B., and Simmons R. E. (1995). Terminal proterozoic reorganization of biogeochemical cycles. Nature 376, 53-56. McGill, W. B. (1996). Soil sustainability: Microorganisms, and electrons. In Solo Suelo 96 Conference 2, CD version, Sociedade Brasileira de Ciencia do Solo (SBCS) and Sociedade Latino-Americana de Ciencia do Solo (SLCS), Vi^osa/MG. Nicholls, D. G., and Ferguson, S. J. (1992). "Bioenergetics 2." Academic Press, Toronto. Paul, E. A., and Clark, F. E. (1989). "Soil Microbiology and Biochemistry." Academic Press, New York. Schink, B., Brune, A., and Schnell, S. (1992). Anaerobic degradation of aromatic compounds. In "Microbial Degradation of Natural Products" (G. Winkelmann, ed. ), pp. 219-242. VCH, New York. Staley, J. T., and Orians, G. H. (1992). Evolution and the biosphere. 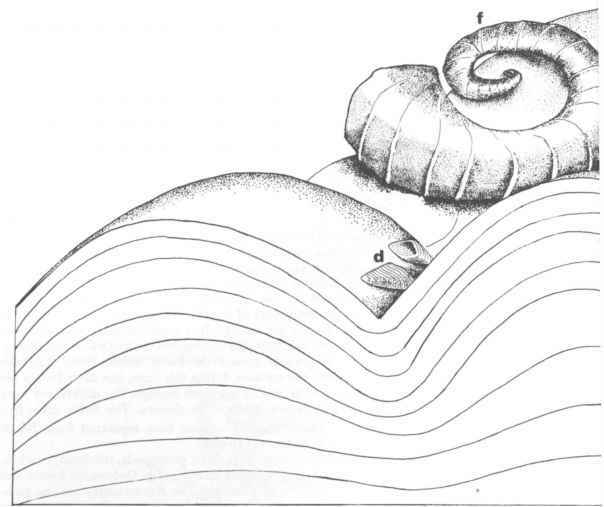 In "Global Biogeochemical Cycles (S. M. Butcher, R. J. Charlson, G. H. Orians, and G. V. Wolfe, eds. ), pp. 21-54. Academic Press, Toronto. Van Cappellen, P., and Ingall, E. D. (1996). Redox stabilization of the atmosphere and oceans by phosphorus-limited marine productivity. Science 271, 493-496.